I'm still stuck on Day 11's declutter. After conducting extensive research on the Internet regarding the use of weak words I'm ashamed to call myself a writer. Words and phrases to avoid are nothing new but my writing contradicts my knowledge. 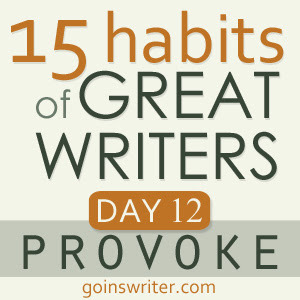 Which brings me to Day 12 in the Great Writers series: provoke. You already know what you need to do. Take a risk. Write something provocative and stand by it. Yes, you may make a few people mad, but you’ll also liberate those locked in self-doubt and fear. Write something bold, something that moves us. Then share it. I'm calling myself out. 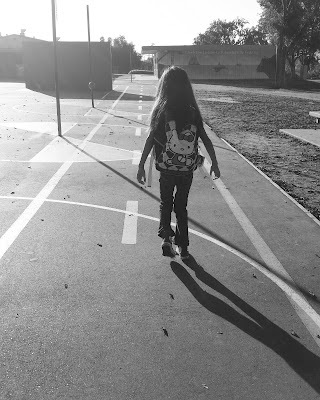 My blog is filled with ugly truths about my personal issues and experiences. I've been told that my transparency invokes a damsel in distress call for "losers" to empathize with me. I begged to differ. I write about the difficult situations I've overcome to help others and to leave a legacy for my grandchildren. I want people (and my grandchildren) to learn from my mistakes. One of my favorite wedding photographers, Jonas Peterson, whom I follow on Twitter posted a tweet about a photographer who stole the work of others and passed it off as her own. Day 6 in this series was about stealing but this woman did NOT give credit where it was due. She adopted the work as her own and faked the funk. Since I read the numerous articles and blog posts about her err in judgment I've been disturbed, not so much for the blatant filching which was reprehensible, but the unabashed label of Christianity attached to her business. I haven't written this sentiment on my blog but she's the kind of person who makes me ashamed to call myself a Christian. I refuse to fall in line with the humanity who has judged her and sent death threats. I've been on the receiving end of a rabid "witch hunt" myself. After reading her apologetic blog post I question her remorse. But I'm not her judge. My imperfections don't place me higher on the moral scale as this woman. I'm having a difficult time comprehending the mindset of someone who thought they could escape discovery while touting Christian values. The blog entry I'm in the process of writing will address this. Will it be enough to provoke?